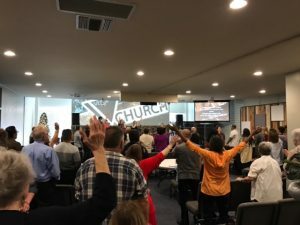 The church plant on Tucson “Verge Church” recently moved into a new facility. God is doing great things with the Verge family. Kailene Markeson, daughter of Rich and Janet Markeson of Verge gives an account of their journey. In year one of our move, we started Verge Church out of our livingroom. Family quickly gathered around and filled the house with worship. We had two baptisms where there was redemption and new life abounding. We quickly outgrew our intimate setting that we had all grown to love so much and began to pray – asking the Lord what our next step was. Soon enough, a building was laid in our hands. 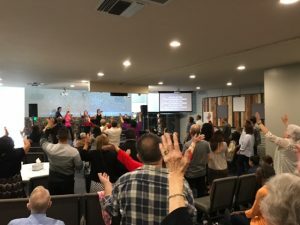 During the remodeling process, the Church family served relentlessly and diligently; the outcome being a space that reflects more of who we are. Now that we are inside the building, we are trying to keep the intimacy we had when we were in our house and attempt to keep from the traditional church building set up. More of the Tucson community is poured and pulled into our family each week. We look forward to this next season which we have coined the Year of Promise. We step into this next season with faith that the Lord will provide and continue to show us His will for Tucson. We thank you all for your prayers over our church and our city!